We’d love your help. Let us know what’s wrong with this preview of Ask the Headhunter by Nick A. Corcodilos. 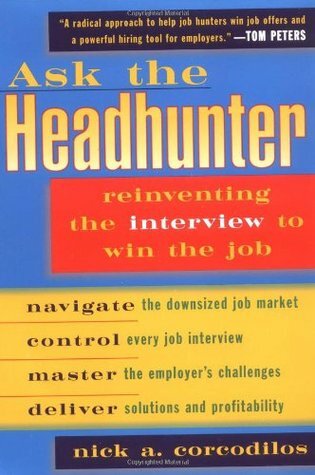 To ask other readers questions about Ask the Headhunter, please sign up. The authors idea is to sell the interviewer on your story of how you can do the job. Of course the key for him is to tell the direct provider of a job rather than a headhunter or human resources person. The point is not to answer the stupid interview questions with the "right" answer but to get to the interview and be prepared to use a flow chart and tell people how you can do the job for them. Its an interesting idea but "seizing" the interview is easier conceptually than in reality. First printed more than 10 years ago, this straightforward how-to manual makes perfect sense, especially in the economy we face today. Don't let job hunting become a full-time endeavor. I'll upgrade the rating to five stars as soon as I land the right job for me! While it's no longer in print, this book was invaluable in changing my mindset towards my job search. It's a good read for anyone looking for a job. I thought the book was a waste of time and I read it very quickly. But the notes I took were invaluable, because I ended up with two job offers. The book basically should be rewritten by a psychologist, but the author is actually breaking down how to give the interviewer different opportunities to "think" of you actually doing the job. That way they stop judging you on irrelevant issues and just get back to focus on "can you do the job." Before this book, I had 13 interviews with no offers. After I thought the book was a waste of time and I read it very quickly. But the notes I took were invaluable, because I ended up with two job offers. The best thing about this book is that this guy hates the gate keepers as much as you do, and offers some solid advice on how to avoid them, even though it's hard. The problems with this book become evident towards the end. He keeps repeating himself over and over saying the same thing in as many different ways as he can until you want to drill part of your brain out. Then he calls you a lazy cow, over and over and over. What a jerk! I was attracted to this book by the powerhouse articles on Corcodilos' website, and it was slightly disappointing. There were a lot of good ideas in the book, but it was repetitive. Maybe this was done to better drill the concepts into your brain, but I was looking for more insights. Definitely worthwhile despite its flaws. Great tips in here for job hunting. You don't need to own it, just find it at the library.